A coronal mass ejection as viewed by NASA's Solar Dynamics Observatory on June 7, 2011. Violent solar storms can blast a surprisingly large amount of material off the surface of the moon, according to a new NASA study. Researchers used computer simulations to examine how sun storms and eruptions of solar plasma, called coronal mass ejections (CMEs), can significantly erode the lunar surface. These tumultuous solar storms could also result in atmospheric loss on planets like Mars that are unprotected by a global magnetic field, the scientists said. This is the first time that researchers have attempted to predict the effects of solar storms and CMEs on the moon. The team of researchers is based at NASA's Goddard Space Flight Center in Greenbelt, Md., and the scientists are part of the Dynamic Response of the Environment At the Moon (DREAM) team within the NASA Lunar Science Institute. 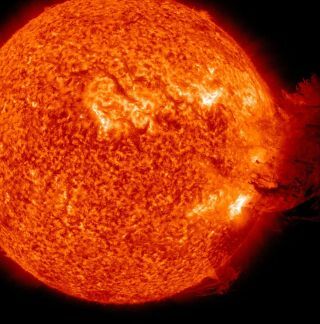 Solar flares can unleash CMEs, which are massive clouds of hot plasma and charged particles that blow outward from the surface of the sun and stream into space. A strong CME can contain roughly a billion tons of plasma that tear through space at a blistering pace of up to a million miles per hour in a cloud many times the size of Earth, the researchers said. Since the moon has almost no atmosphere, Earth's natural satellite is vulnerable to the effects of space weather. As a result, plasma from CMEs is able to penetrate the moon's so-called exosphere and crash to the surface, kicking up particles from the moon in a process called "sputtering." "Sputtering is among the top five processes that create the moon's exosphere under normal solar conditions, but our model predicts that during a CME, it becomes the dominant method by far, with up to 50 times the yield of the other methods," said Rosemary Killen, research team leader and the lead author of a new study that will be published in an upcoming issue of the Journal of Geophysical Research Planets. CMEs are able to blast away lunar material because the material is denser and faster than normal solar wind, which is typically dominated by lightweight electrically charged particles of hydrogen, called ions. Plasma from CMEs is enriched in highly charged, heavy ions, which sputter ten times more atoms from the surface of the moon than a hydrogen ion, the researchers said. They found that helium ions make up about four percent of normal solar wind, but during a CME, this concentration can increase to over 20 percent. When this enrichment is combined with the increased density and velocity of a CME, the plasma ions can sputter 50 times more material than the lightweight hydrogen ions in the normal solar wind. "The computer models isolate the contributions from sputtering and other processes," study co-author Dana Hurley, of the Johns Hopkins University Applied Physics Laboratory in Laurel, Md., said in a statement. "Comparing model predictions through a range of solar wind conditions allows us to predict the conditions when sputtering should dominate over the other processes. Those predictions can later be compared to data during a solar storm." NASA's Lunar Atmosphere And Dust Environment Explorer (LADEE) mission, which is slated to launch in 2013, is expected to test these models, the researchers said. From its planned orbital altitude, the LADEE lunar orbiter should be able to detect atoms kicked up 12.4 to 31 miles (20 to 50 kilometers) from the surface of the moon by this sputtering effect. "This huge CME sputtering effect will make LADEE almost like a surface mineralogy explorer, not because LADEE is on the surface, but because during solar storms surface atoms are blasted up to LADEE," Farrell said. The Sun unleashed a large X class (strongest category) flare late on Sept. 7 and into early Sept. 8, 2011. The image was taken in extreme ultraviolet (UV) light from SDO. Scientists have previously studied the effect of solar storms on Earth's magnetic field, and it has long been known that solar flares and CMEs can ramp up intense aurora displays on our planet. But for planets like Mars, which does not have a global magnetic field, solar plasma could sputter and erode the planet's upper atmosphere, the researchers said. NASA is planning to launch the Mars Atmosphere and Volatile Evolution (MAVEN) mission in late 2013. The spacecraft is designed to orbit Mars to study how solar activity, including CMEs, removes the atmosphere of the Red Planet. From their models, the researchers also predict that exposed small bodies such as asteroids are also vulnerable to sputtering in a process similar to that on the moon. In addition to upcoming papers in the Journal of Geophysical Research Planets, the researchers also presented their findings on Monday (Dec. 5) at the 2011 fall meeting of the American Geophysical Union in San Francisco.